On the 10th of February I got my 3rd tattoo. 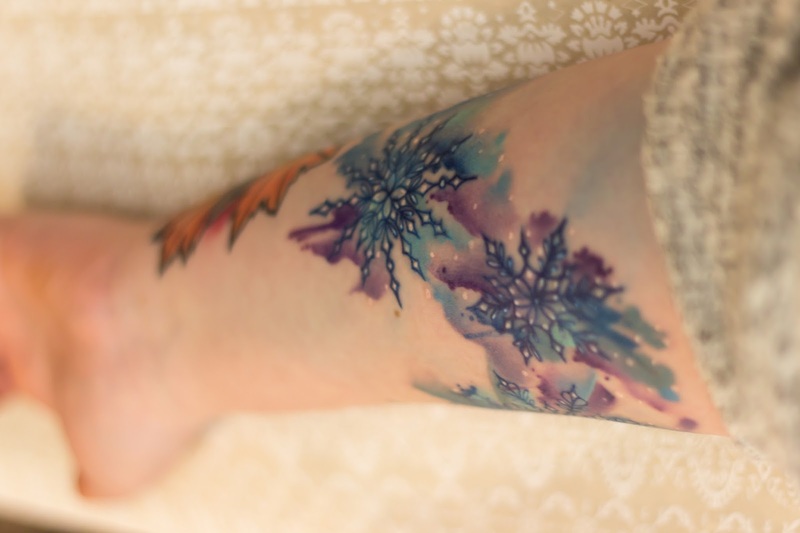 I am totally in love with water colour tattoos & have been since I started seriously looking to get tattoos. 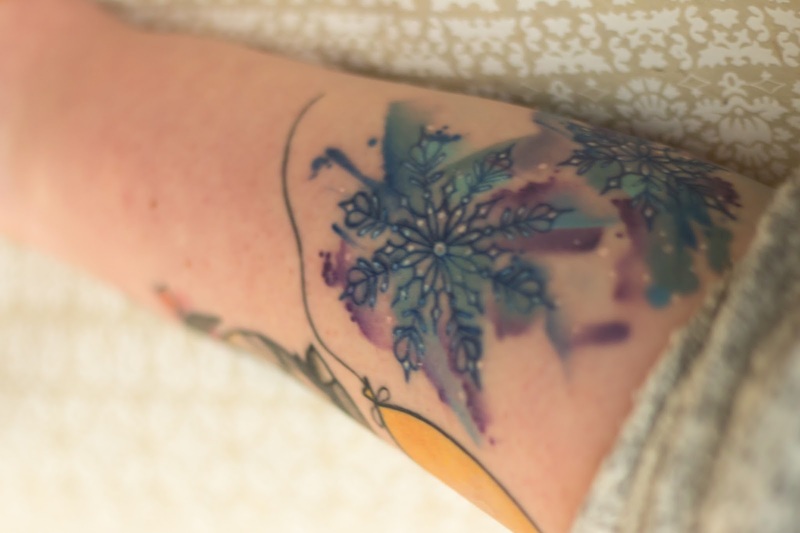 I love the way watercolours looks in general & in tattoos it's mind blowing! The way it looks almost like it should be painted on but that it's done with needles, unbelievable! I have total respect for tattoo artists who specialise in this style, they are mind-blowingly talented. (website, facebook, instagram) who was at a guest spot up in Leeds. 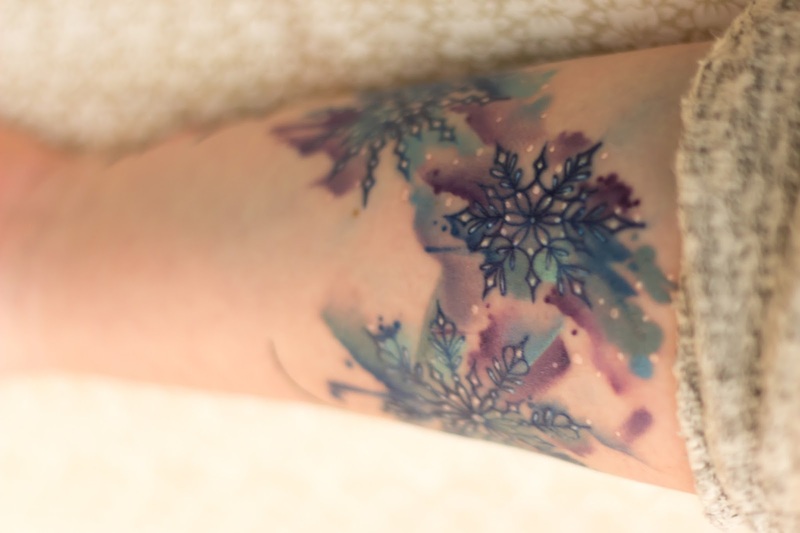 I have this whole 'four seasons' theme for this forearm & when I saw she was guesting up in Leeds I KNEW I had to get her to do my snowflakes. If you look at her instagram you'll see that she doesn't do a massive amount of watercolour but when she does they are exactly the level of water colour I like (examples here & here). Anyway part of why I do these posts is to talk about the reasons behind my tattoos. All of my tattoos have complicated reasons (what tattoo doesn't) but before I get into it, this is not a 'Frozen' tattoo, not that I think there is anything wrong with that but personally I feel like Disney tattoos date badly. When I was planning this tattoo, way before I got my balloon tattoo, I had this idea for the 4 tattoos I was going to get. I definitely wanted a spring flowers tattoo, a yellow balloon & the house sparrow on a maple branch, so I had this whole season's theme but I couldn't think of anything wintery. I wanted snow but inner city Leeds never gets 'proper snow'; in the countryside you get proper, powdery snow that can be used for snowballs & snowmen or whatever. In my area it is either frozen or sopping wet & always grey. I can't count how many stories of my childhood include that snow & although no one of those stories is enough to merit a tattoo of their own, as soon as I started thinking about that snow I realised that a tattoo that summed up those memories & those stories for me would mean a lot & so grey, melted snow became an unbelievably beautiful blue & purple watercolour tattoo....it tracks lol.